2019 Commencement will be at 2 p.m. May 11, 2019 at INTRUST Bank Arena. More specific details will be provided later. For those who are not able to attend the commencement ceremony in Wichita but would still like to watch a loved one receive his or her diploma, the University will be streaming the event live on its website. Visit friends.edu/commencement-live during the ceremony to watch the live stream. In addition, friends and family can tweet messages of congratulations to their graduates that will be shown on the large screen. Live tweeting will occur 30 minutes before the ceremony and while graduates are crossing the stage. To participate, sign into Twitter and use this hashtag: #FriendsUGrads. Only users with public accounts will be able to have their tweet shown on the screen. Saturday, May 11, 2019 | 2 p.m.
Graduate check-in starts at 1 p.m. Graduates should enter at Entrance B on the southeast side of the arena. You will need to stay in line once you check in. Doors open to guests at noon. Guests may use Entrance A or B on the south side of the arena. There will be no access from Entrance C on the north side of the arena. INTRUST Bank Arena Requirement: All patrons are subject to search. To make the process of the security searches fast and smooth, please have all items removed from your pockets, and open all jackets and purses. If you have questions, please contact the facility at 316-440-9000. Graduates will remain seated with their classmates for the duration of the ceremony. There is no rehearsal or practice. Entrance tickets are not required for guests. Your prompt arrival for check-in and line-up is appreciated. Diplomas are not distributed at Commencement. Diplomas will be ordered and will be available for pick up or mailed to students when all academic requirements are met, financial obligations are paid and degrees have been verified. All degree requirements must be successfully completed in order to receive a diploma. Minimum standards for undergraduate honors recognition include an overall GPA and Friends University GPA of 3.60. Honors candidates will receive red cords at the Commencement ceremonies. Saturday, May 11 | 11 a.m. to 12:30 p.m.
You and your friends and family can enjoy heavy hors d’oeuvres. Faculty, staff and classmates are also invited to celebrate with you. Transportation service will be available between campus and the Commencement Ceremony at INTRUST Bank Arena. RSVP for the reception by Monday, May 6. Please RSVP for the event by using the Pre-ceremony Campus Celebration RSVP form. Regalia (cap, gown, tassel and hood) is available for purchase from the University Bookstore. Bring your cap, gown, tassel and hood to the ceremony. Gowns should be pressed. Hoods are for graduate students only. Bookstore contact phone number: 316-295-5869 or 800-794-6945 ext.5869. Transportation will be available between campus and INTRUST Bank Arena prior to and after the Commencement ceremony if graduates and their guests would prefer to park on the Friends University campus. A bus will take graduates and their guests to INTRUST Bank Arena approximately every 30 minutes from 11:30 to the start of the ceremony at 2 p.m. The pick up area on campus will be near West University Avenue south of the Davis Administration Building (the clocktower building). The bus will remain near INTRUST Bank Arena during the ceremony. It will return grads and their guests to campus following the ceremony from approximately 4:30 to 6 p.m. Please remember to remove all valuables and lock your cars. If you wish to drive to INTRUST Bank Arena, learn more about directions and parking options. The following hotels offer discounted rates to Friends University students and families. Mention the University’s graduation weekend when calling to book your room. GradImages is Friends University’s official commencement photographer. 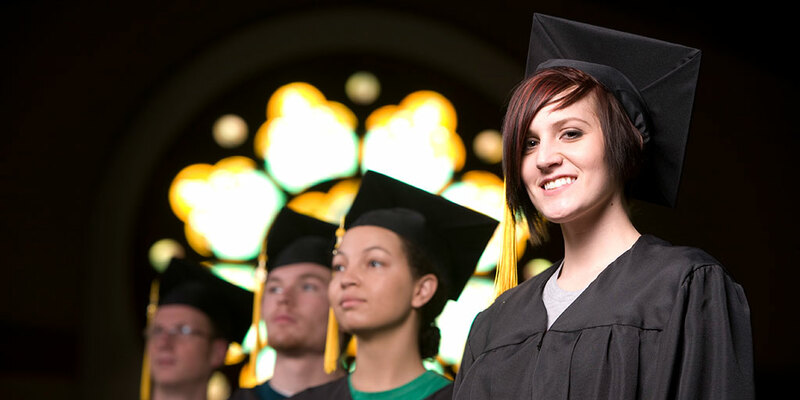 Friends University provides GradImages with your email and mailing addresses. You can also register your contact information (and the contact information of up to six friends and family members). Proofs will be sent to your home and email address within five days of graduation. Pictures can be ordered online, by phone or by mail. GradImages can be contacted at 800-261-2576 or www.gradimages.com. A professionally produced DVD of the Wichita ceremony is available from Kent Audio Visual for $15. Please contact Kent Audio Visual for more information at 316-262-4487, and reference your Friends University graduation ceremony. Videos may also be available for purchase from recent Commencement ceremonies as well.